- frantically knitting scarves and mittens during Max's naptimes in the endeavour to keep my children warm this winter. - watching re-runs of Downton Abby while I frantically knit. - enjoying spending time with and cuddling my Maxi who is rocking a particularly retro look today. - constantly putting logs on the fire to keep it roaring so this concrete and tile house of ours stays warm-ish. - making pizza for dinner tonight. Quick and Easy. And the oven helps to heat the house. - wondering if I need to look into the possibility of Beni being lactose intollerant. He pooes way too much and messily than I am sure is normal and necessary. - blowing my nose every 5-7 minutes. - folding that mountain of washing that has been sitting on the couch for the past week. - drinking way too much coffee. - willing the 17th of November to arrive speedily because that's when I'll see my husband again. - so very grateful to my husband for working so hard to keep us clothed, fed and comfortable in Italy. Sounds hectic and I'm sure the boys are keeping you super busy. 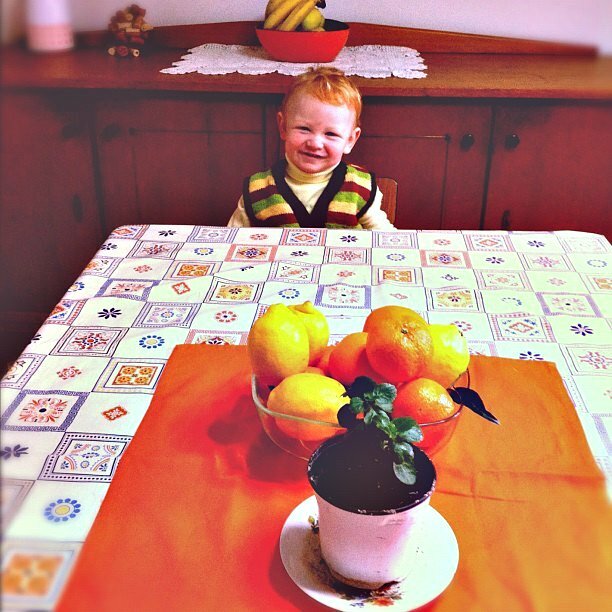 Max looks adorable in his retro vest. Hope you are all back together soon in a nice house in London.